Due to technical difficulties, the June 7 finals weren’t completed until June 21, 2015. 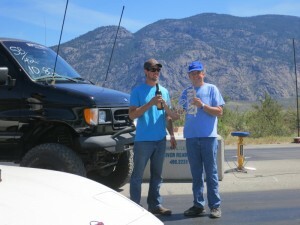 Wade Reimer from Summerland, BC (’97 Ford van) took the trophy by defeating Osoyoos, BC’s Bailie Ericson (’03 Infinity). Tonasket, WA resident Paul Lewis (’84 Corvette) won his bracket by default. His opponent was not present for the final round. Brad Heppner (’89 Ed Quay dragster) drove a long way from Sicamouse, BC. 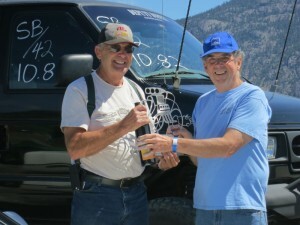 He managed to drive past Lorne Pearson (Grand Forks, BC) in his ’86 Chevrolet S-10 truck. 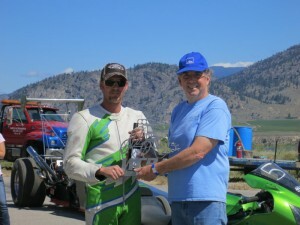 Oliver, BC’s Warren Brown (’02 Kawasaki) won by default. His opponent was not present for the final round of elimination.